Advantages: Compact and useful format for modellers; summary coverage of entire Banshee family including Korean War service and Canadian operations; packed with helpfully captioned photos; attractive cover art - front and back; supporting narrative text. McDonnell was an aircraft company undertaking sub-assembly work from major manufacturers during the Second World War. During this period, the company also received funding from the US Army to develop its own twin-engine fighter, the XP-67 Moonbat. Although this design did not receive a Government contract, a similar airframe was mated to two Westinghouse turbojet engines to create the XFD-1 Phantom. With the awarding of a contract for 100 aircraft, the Phantom became the first US Navy jet fighter. The Phantom was the obvious immediate ancestor of the Banshee, but despite the visual similarities between the two fighters, the Banshee was a totally new design. Squadron's "FH/F2H Banshee in Action" starts with the story of the Moonbat and the Phantom, and briefly covers the development of the XF2D-1/XF2H-1 Banshee, followed by a description of the operational US Navy Banshees - the F2H-1. F2H-2, F2H-2B, F2H-2N and F2H-2P. Operations in the Korean War are described, followed by the story of the F2H-3, F2H-4 and Canadian Banshees. As with all of Squadron's "In Action" books, this title is crammed with more than 80 contemporary photos. Ten colour profiles whet the modeller's appetite for a good, affordable kit of this attractive aircraft. Don Greer's attractive artwork adorns the front and back cover of this very handy book. 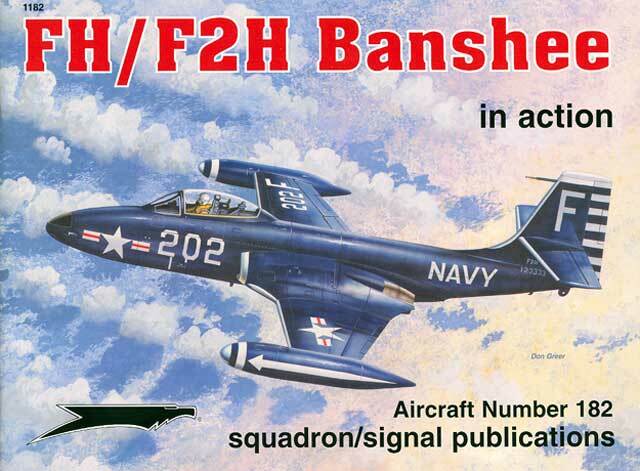 This recent "In Action" title provides a low-cost primer on the subject of the FH/F2H Banshee. Now how long will it take until some major manufacturer actually releases a kit of this important type in 1/48 scale?